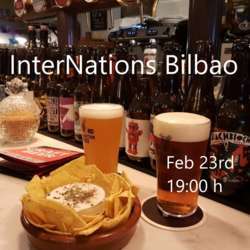 Its a big pleasure to invite you to our February InterNations Event! Join us at Morrocotudo and meet Expats and Global minds from all over the world! Come, see and get to know the people who share expat life with you in our city. Don´t hesitate to bring your friends and spend a nice evening with us over a beer or a wine! At Morrocotudo, you will be able to try the Gin-tonics by José Ramón Gonzalez Chato, champion of the Barmen Association of Bizkaia and National finalist of the Worldclass Competition 2015.
great selection of wines that vary each month.. I am looking forward to seeing you on the 23rd!